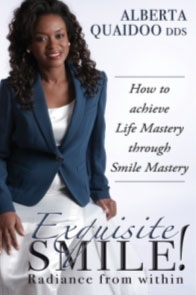 Dr. Quaidoo's book "Exquisite Smile! Radiance from Within – How to Achieve Life Mastery Through Smile Mastery" will be published in Spring 2013. The practical insights, professional expertise, and passion of the author will guide readers in achieving a life of health, beauty, happiness and success by starting with a healthy smile. It examines trends in cosmetic and general dentistry and describes solutions to overcome the most common impediments to achieving and maintaining an beautiful smile, an important and often overlooked gateway to success and happiness.